I was born in Belisce, Croatia, an industrial then small city, where the Gutmann Werke thrived. The Barons Gutmann, two brothers, owned a transportation/railroad, and lumber company. They built the railroad to transport lumber down the mountains to Belisce where it was processed into building material and paper. My father was a young executive with the transportation company and my mother’s father was an executive with the lumber company. My parents met at the many social gatherings that the Barons Gutmann held for their employees. 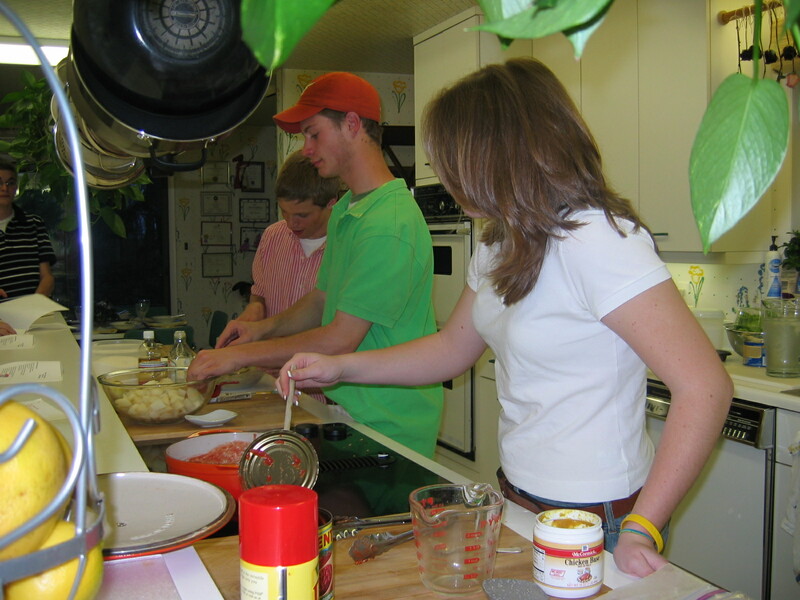 My life and how I became a cooking teacher! On both sides of my family I have inherited the cooking and baking talents. My father’s father, my grandfather, was a butcher and owned an Inn in Veliscovci, Croatia. My mother’s grandfather, my great-grandfather, was a “Fein Baecker” in Vienna (pastry baker). Both these men lived during the Austro-Hungarian Empire. My grandmother, my mother’s mother, was an excellent cook who I credit to have started me in my love for cooking. Whenever I visited her she asked me what I wanted to eat and she quickly fixed it for me. Under her supervision I cooked my first scrambled egg at age 4. Later, during WW II we were refugees from Croatia, Yugoslavia at that time, and lived for seven years in Austrian refugee camps. My mother was an absolute whiz when it came to create edible things with very little ingredients and no recipes. Even when we came to the U.S. as immigrants in 1951 she cooked without any recipes for years. Her cookbooks all got lost during the ordeals my family went through. I wish I had them now, if for no reason but to have a link and basis for my love for cooking. I often cooked the meals after school while my mother worked as a nurse’s aid at the Shriner’s Hospital. We always entertained with what little we had and always had friends over, particularly on weekends. After finishing college with a B.S. in Biology and Medical Technology, I worked in Hematology and Immunology Research in the U.S. as well as in Germany, at the University of Tuebingen, and Italy, at the University of Torino. After marrying, I stopped my carrier as a “research scientist” and became a homemaker and mother. When our son started 1st grade I began volunteering at his school, and became a member of the Parents Club and was the Hospitality Chairman for five years. During that time I organized many functions which involved cooking and entertaining. 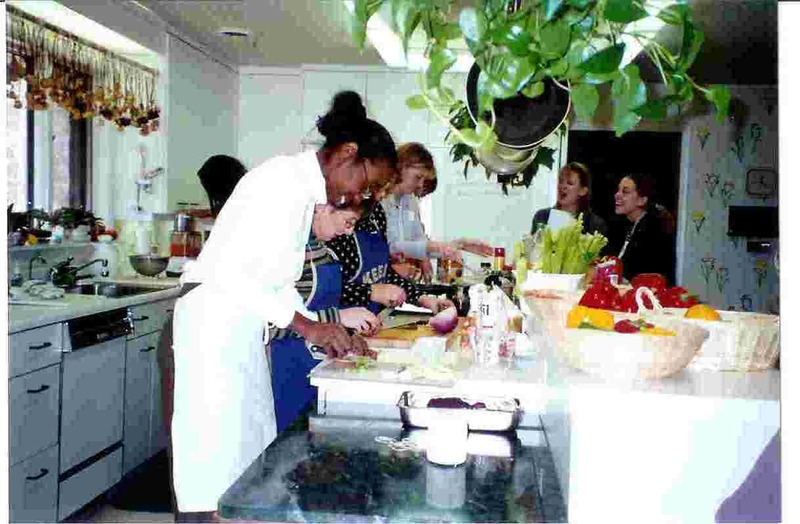 Ending my time with the Parents Club in 1991, I was urged by many of my friends to start teaching cooking classes. I did just that, and have had Maja’s Viennese Kitchen Cooking School since then. My teaching is seasonal. Spring and fall are the busy times of the year. 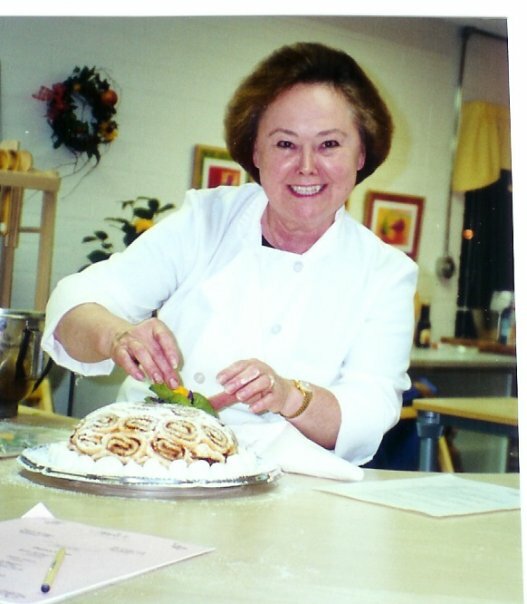 I have taught up to 15 individual classes per season, transferring all my laboratory skills, peppered with love and passion, into my kitchen, which I call the “Cooking Tech. Lab.” During the winter and summer months I attend culinary schools for continuing education courses. 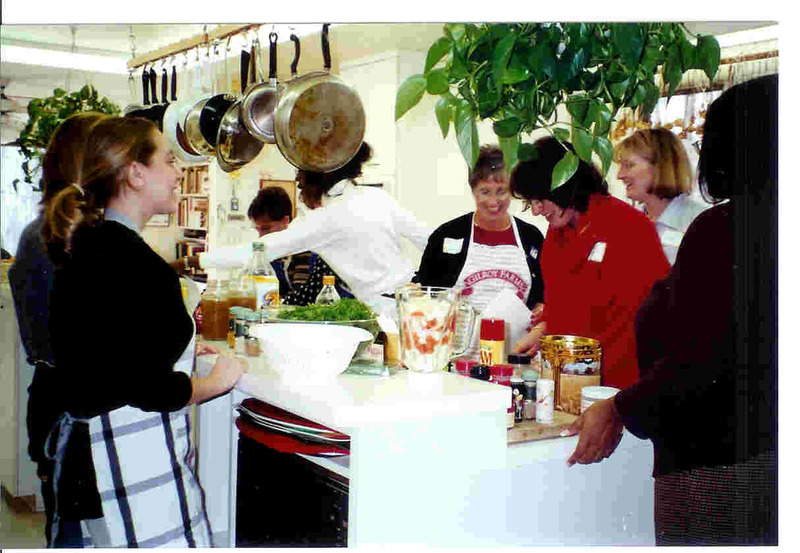 The following are the cooking schools I attended…….. I am a participating member of………. International Association of Culinary Professionals I attended my first conference in 1996, and attended conferences every year since then. I regularly attend local or area classes and seminars as they are available and if they are helpful in my work. Besides teaching in my own kitchen, Maja’s Viennese Kitchen……. 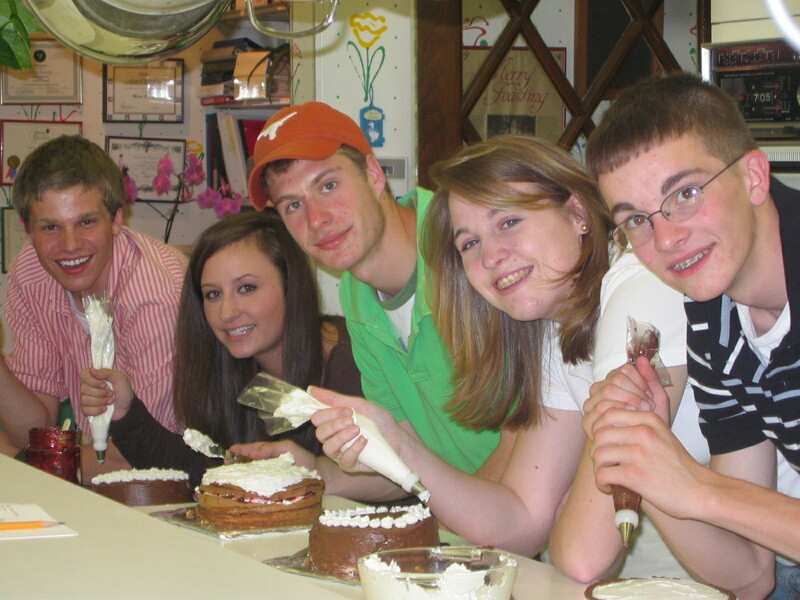 I give Private Classes for High School Seniors and recent college graduates as well as young professionals. In the past teaching culinary classes has extended into the Bed and Breakfast industry where I am a consultant to Innkeepers with “tired” breakfasts. I created or re-created menus and designed plate presentations and table settings, as well as cooking lessons in B&B for guests or the innkeepers. A Group of happy students! Thank you for sharing your life story, you are truly an amazing woman. Even in such difficult times you rose above it and have done so much with your life. Yesterday at my daughter’s house with her mother-in-law and aunt in-law, I told your beautiful story of when you were 12 and the lilacs for your mother. I was so touched by that, the love you held for your mother and the heart you have shines through your eyes and actions. Enjoyed learning of your history! So few in the US actually know the history of the former Yugoslavia especially after WWI & WWII and the most recent Civil War there. Maria…my father and his family were also from Velisvci, fleeing during the war. I have reconnected with my cousin, Vladimir Domanovac, who now lives in Zagreb (his cousin and their family live in Belisce). I’ve been trying to find/and or recreate the foods of my childhood, as well as those I eat when visitng Croatia. I’m interested to learn if you know anything of my family, and also where I can learn to make the specialties I love. My son-in-law is from Glina (actually a village 11 kilo from there) which is located south of Zagreb. Anyway, his mum, Milka was a top chef before the civil war in the Casino a hotel there, and latter for 3 years in Pristina, Kosovo prior to coming to the US as refugees about 10 years ago. I have many of her recipes I am happy to share. Write me at Shantihhh@sbcglobal.net. Today I am making the stuffed tomatoes, Ronde de Nice squash and peppers. Sort of Sarma I guess I forget the name Paradiz something for the tomatoes. If we’d known how much fun grandchildren were we’d have had them first! What a lovely blog. I will return often. My blog http://www.cybercookscookingcorner.blogspot review other food blogs rather than posting recipes. However, I am taking a break while I battle breast cancer. My last day of radiation is Friday, October 1, 2010. I hope to resume posting aroud the middle of October. When I do your blog will be among my first reviews. What a nice surprise to receive your comment/note this morning. It is a wonderful compliment coming from you who sees so many blogs……… I am so pleased you like my blog! I wish you a quick and complete recovery very soon. Just…. do not ever lose HOPE!!!!!!!! Stan what a pleasant surprise to hear from you on my blog………thank you for your nice words and compliment…….you are so very kind..
But…….the “Prose Writing Class” that we share has been a tremendous help and all the positive encouragement I have received this past year had driven me on……. I’m so happy I stumbled upon your blog! Can you please consider posting a story about zagorske strukle, kestenj pire and of course palacinke! North Americans are so deprived of these great little treasures that every Croat delights in regardless of where they call home. I’ve never met a Croat that doesn’t like palacinke – have you? Especially with nutella and ground walnuts topped with whipped cream served with a strong turkish coffee. Heaven! I’m so excited about your cookbook. My friends always ask what is Croatian cuisine? Difficult to say, as we “borrowed and are influenced by the Austro-Hungarian empire and to the south the Italo-Roman-Venician Empire…don’t forget the Turkish delights. That just about sums it up and there you have food with a Croatian twist, that is simply delish! Reading your note…….I felt like I was writing it……..I wish we could meet sometimes……….it would be really fun! Hugs and kisses right back at you my dear! The internet is a wonderful portal…it connects and touches the gentle souls, especially with roots from the Adriatic coast and other parts of Croatia. We are a small nation but very resilient ,diverse and kind. I love that my forefathers and roots are from this beautiful country. A jewel – with such a rich culture. I would indeed love to meet you too. If you ever decide to visit Toronto, please notify me. Perhaps on a book tour? If I ever visit Baltimore I will do the same. I have already passed on your blog info to all my Croatian friends and family in North America and Croatia since all of them speak English. I really can’t wait for your cookbook to come out…there are so few cookbooks for my generation living in North America that we can turn to for traditional Croatian delicacies…translating recipes from metric to imperial measurements is so tricky. Baking is a science and definitely needs to be exact. I look forward to your future posts and childhood memories. You’re the best, love to open my email’s from Maja. Love hearing the history behind our favorite food. I would love to feature some of your recipes, giving you full credit. Maria, I’m so sorry I called you Anna. I must be having a senior moment! I’m so glad I stumble upon your blog! I enjoyed every part of it especially your story. Your personal connection to your readers is delightful. Like you, I’m always dreaming of being a chef someday. As a preparation, I’ve been visiting blogs everyday for more refreshing and up-to-date ideas. Recently, I’ve been engrossed in looking and trying recipes from different countries from Europe. As a food enthusiast, I can’t help but to share the news I got from my facebook account last night. I think you might get interested in. It’s a competition from IngredientMatcher where you can cook your national dish. The stake? A chance to win an Ipad mini or money! You choose!